For whatever reason I have far too many half eaten bags of oats lying around my pantry. So this week I baked a version of Sarah Owens' honey spelt oat bread - without the spelt. As has been a theme of late for many of us, Trevor Wilson was the inspiration. 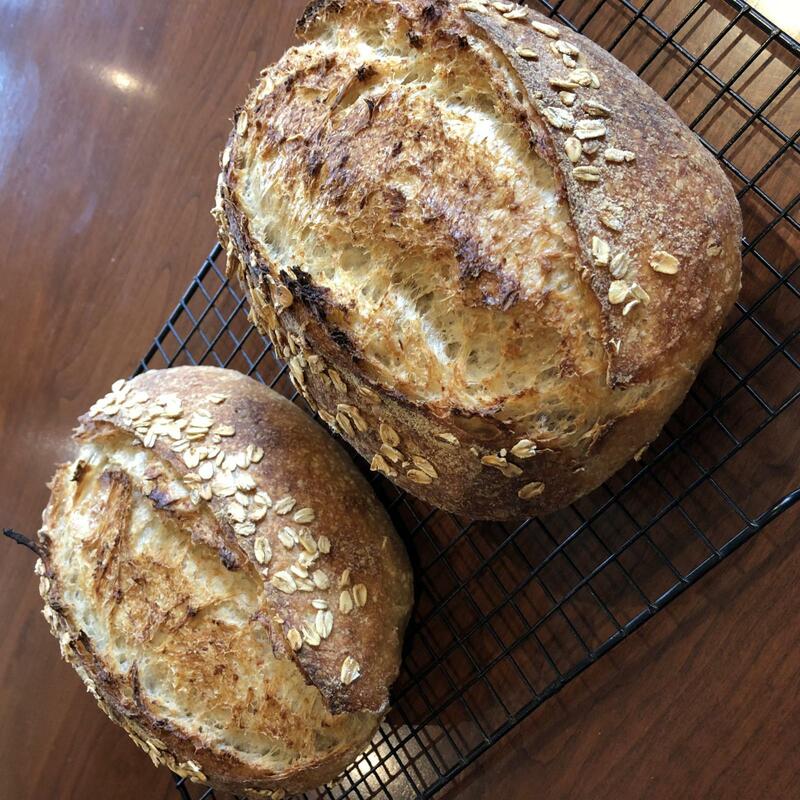 Trevor has been posting on Instagram some great fluffy-crumb pastry flour breads. I didn't have any pastry flour to use so I improvised with some all-purpose, whole wheat and bread flours. I thought using an all-purpose flour with it's lower protein content would be a reasonable substitute for pastry flour. 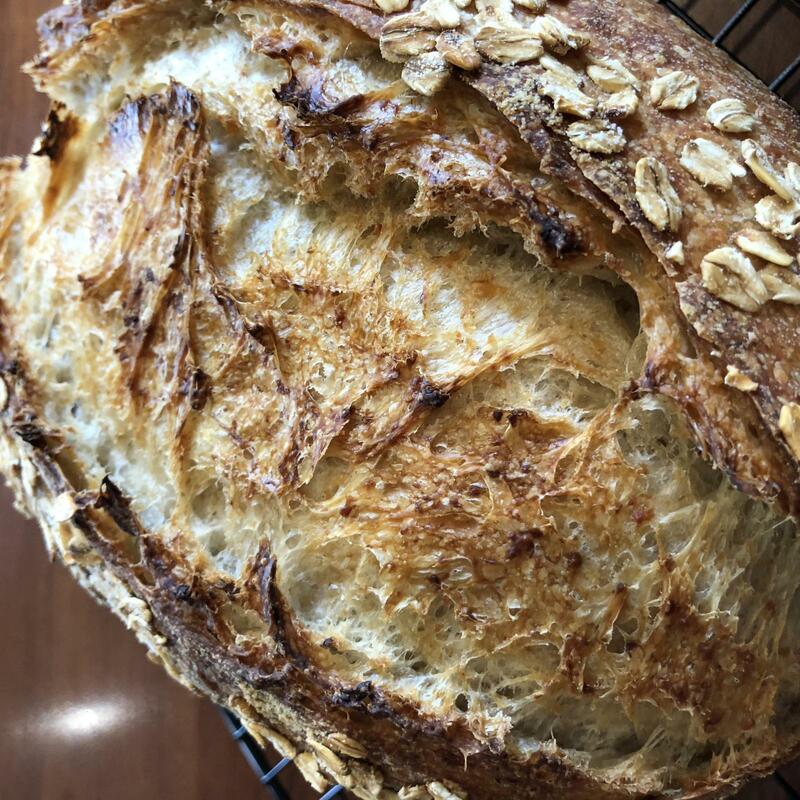 I used : 140g of flaked oats in an overnight soaker with a 110g mature levain (using AP flour) ; 45g of amber honey (I think next time I'll use maple syrup as "tis the season" in Canada) ; 105g AP flour ; 45 g whole-wheat flour ; 400g hard bread flour ; and 11g salt. Total flour (including the levain) was 605 g (26.4% AP, 7.5% whole-wheat and 66% bread). Total water (including levain and soaker but not the water content in the honey) was 575g. So the hydration is about 92% - but it wasn't anywhere near as slack a dough as you'd think given that number because the oats were thirsty. I'd increase it to 100% next time just to see how it changed it. This was a stiff dough. 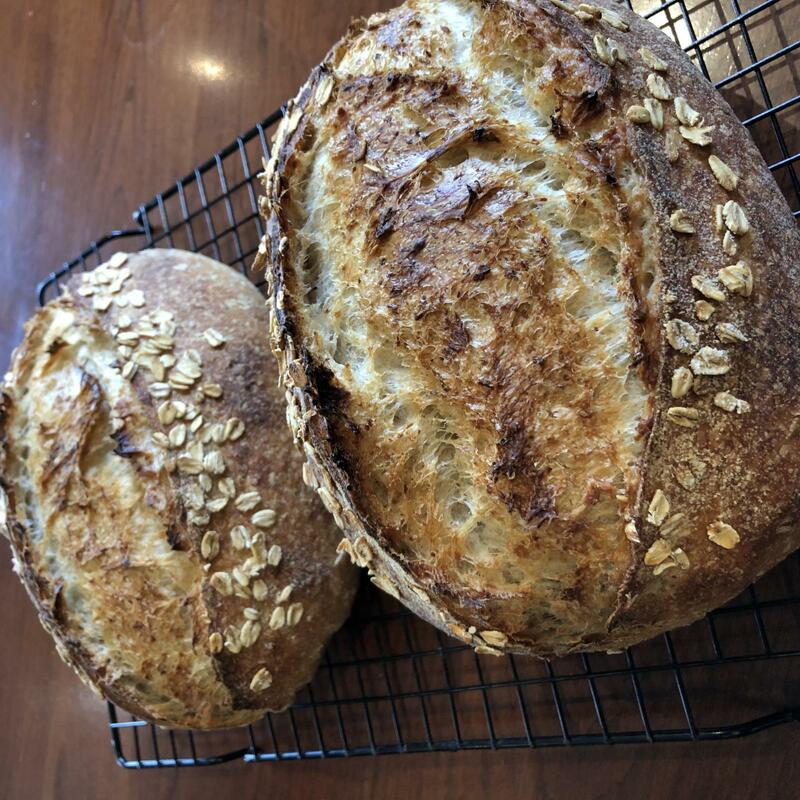 I worked the levain and water into a slurry and it took a while to incorporate the soaker and break down what by the next day became a dense clump of moist oats. Trying to create structure to build an open crumb was near impossible as the dough wasn't very extensible. After all was mixed together I gave it three additional stretch and folds (as best was possible) an hour apart while it sat in a warm spot in my kitchen. I then placed it into my oven with the light on for bulk - another four hours. When it had clearly doubled I divided the dough, pre-shaped into boules and gave it a short bench rest before shaping into batards for an overnight fridge retard. Bake was mid-morning at 450 for 20 and 15 in a combo cooker. They had a great rise and bloomed very well. The one issue I had with them was that in the morning the dough seam had split open a fair bit on both loaves (they were loaded seam side up in the baskets). I wet them a bit with my hand and then tried to stick them shut just before loading them into the combo cooker. 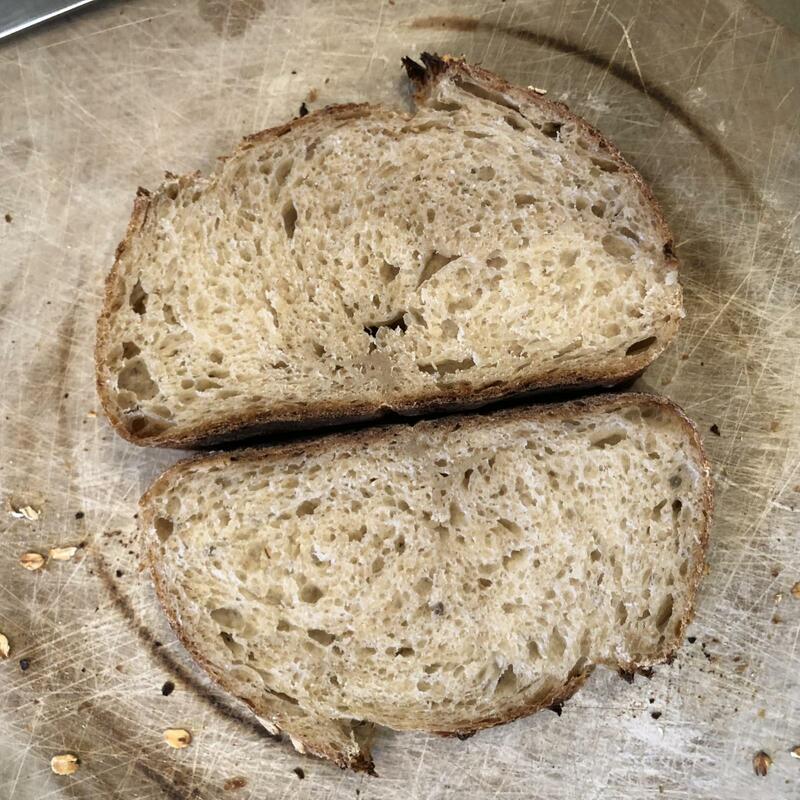 The crumb below is very soft and fluffy - it's very nice and the flavour is very earthy. The oats really come through. The honey is noticeable but not overwhelming. At the base of the loaves you can see the spot where I tried to wet and then stick the dough together just before loading - it's a 'damp spot'. This was just a shaping technique mistake - I should have made sure to properly close the seam when I shaped them the night before. Overall, a great bake and one I'll repeat many times! Bake happy..
Those are beautiful! One of my favourite breads is this recipe and you have outdone yourself. I am surprised that your dough was so stiff. I don’t remember it being particularly dry but I do remember the first time I made this that the proof went on forever; it was something like 7+ hours to get it to double. Anyhow, it is a delicious bread and I am not surprised that you will repeat this. Try using Spelt and Spelt flakes or Kamut and Kamut flakes to change it up a bit. Spelt and Kamut flakes are both available at Bulk Barn. I think they also carry Spelt flour and Kamut flour. I'd say it took about eight hours from mixing to shaping.. had I not put it in the oven with the light on for bulk (which gets the temp to low 80s) then I definitely would have been up much longer that night.. I've never baked with Kamut. I'll make a run to bulk barn and give it a try - thanks for the suggestion! Makes a very tasty loaf and your loaves look perfect. I think everyone experiences this as a dry dough without much extensibility but with time, stretch and folds etc it turns out very nicely indeed.